The tailoring industry is known for its creativity. Most of the influential tailors are known for their crazy ideas, rapidly changing styles, and cut throat competition. Most industries never experience that kind of volatility. There are a few areas, however, where tailoring industry has remained largely undisturbed. But tailoring industry has created a small degree of stagnation and consumer dissatisfaction for the fashion lovers in the current generation. Current generation customers expect more and more from the tailoring business store. 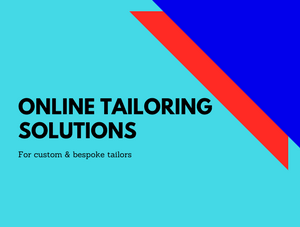 So tailors and business people who are willing to start their online tailoring business store should be aware of the current trends to make your online tailoring business store a successful one. More and more industry experts are catching on to the importance of technology in tailoring industry. One area that is causing the industry to pivot is mobile technology. Want to boom in online tailoring business? Try to avoid the simple mistakes to uplift your online tailoring business store. Let us discuss the common mistakes made by most of the store owners who start their own online tailoring business store. A constant mistake made by many tailors and business people is with their tailoring business website. Launching a brand with common tailoring business features and free domain name makes you look unprofessional when compared to your competitors. It doesn't sense for the safety of the consumer to spend their money. customers think if the store owners can’t even buy a domain name then how customers will buy apparels from your tailoring store. So create your online tailoring business website with high-end application to build a trust with the end user. There are unlimited great ideas to make your online tailoring business store look unique. The store owners should spend their time in web-based research to identify the latest technology that works for your online tailoring business store. The end user gets attracted towards the latest technologies like augmented reality (AR) and virtual reality (VR). So use such features like AR & VR in your online tailoring business store. The design is an investment and more important in the case of tailoring industry. If the design isn’t good, then achieving our business success is also far. Hire a professional software to bring your vision to life if you can’t do it yourself. This doesn’t mean you are giving up control to a tailoring business software. There is a common misconception that starting a tailoring business store is easy. Starting may be easy, but maintaining even a year and turning a profit is something a challenging task. Fit4bond online tailoring software makes your work much simpler. Fit4bond provides all high-end application in the single package. Fit4bond also offers its high-end features in the form of a woocommerce plugin for online tailoring business to boost their online tailoring business sale. online tailoring business, online tailoring platform, online tailoring software, online tailoring business store software, custom tailoring store script, online tailoring script, WooCommerce Plugin for Online Tailoring business, Wordpress plugin for online tailoring business, online tailoring platform software, online tailoring platform script, custom tailoring software, Bespoke tailoring software.